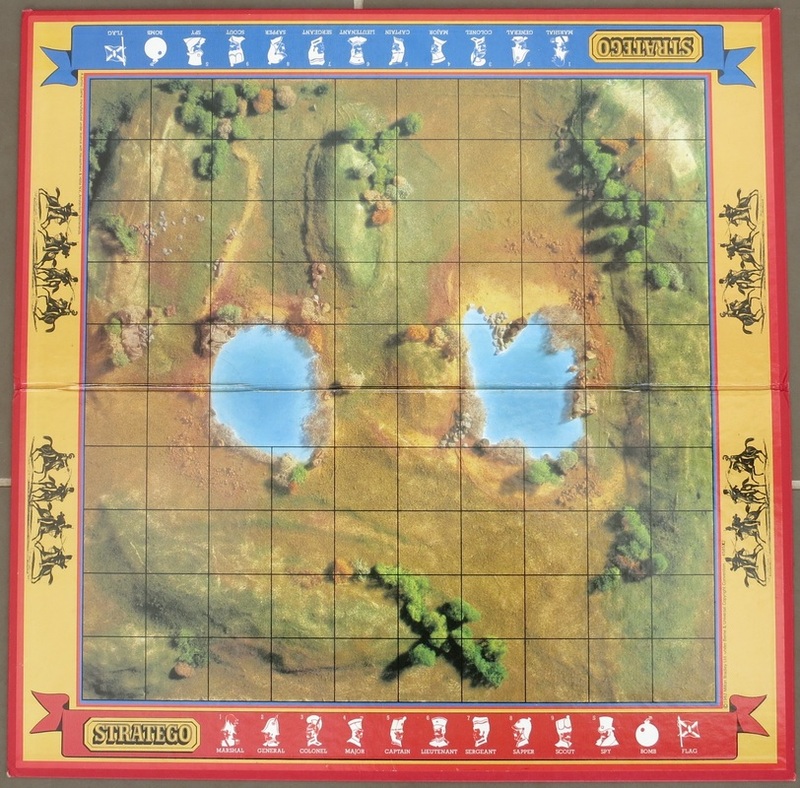 Stratego is a two player strategy game, whereby the goal is to capture your opponents flag by moving a piece onto it. 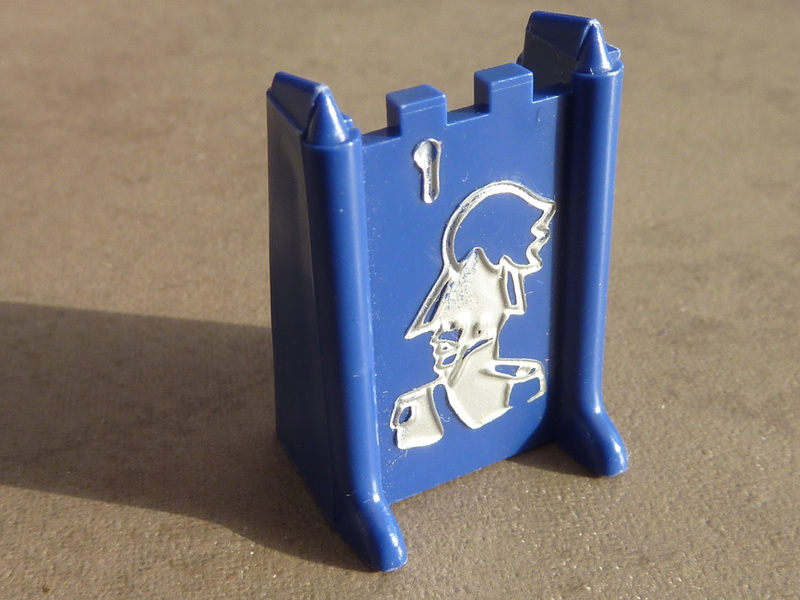 It's a simple design concept but compelling to play due to the strategy element of setting up your pieces and need to remember the strength of your opponents pieces after they are briefly revealed to you during battle. 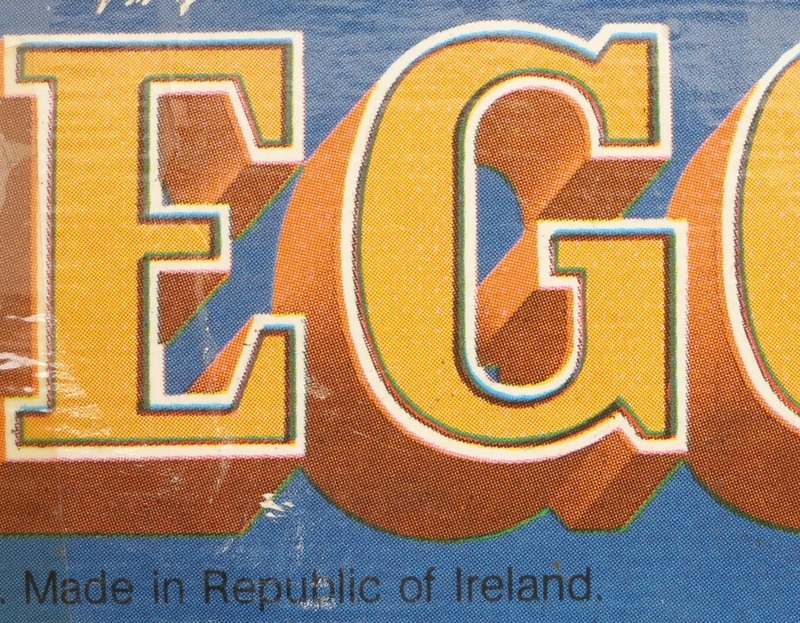 Decent two player board games are few and far between, so 'Stratego' is a game all board game lovers should have in their collection. You will likely spend almost as much time setting up your pieces at the start of the game, than you will actually playing it! 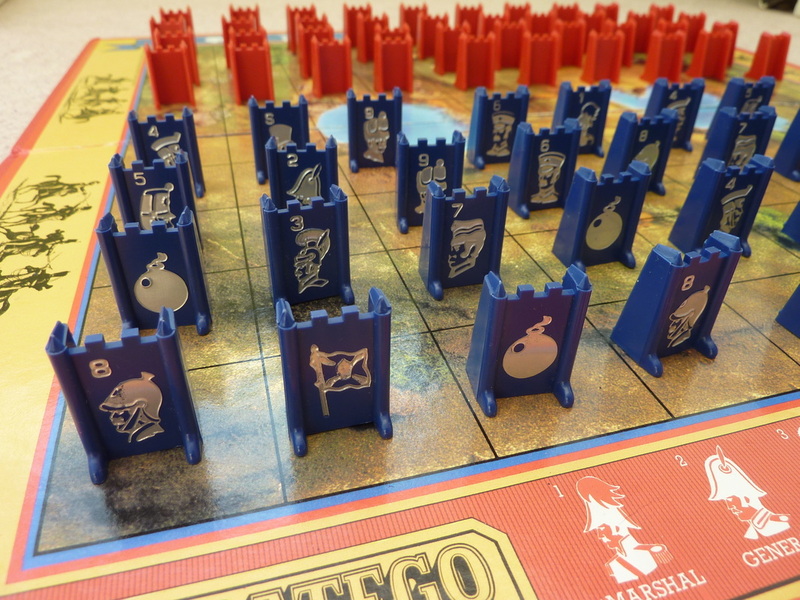 In Stratego, each player must position 40 pieces before the game can begin. And each of these can placed in any combination you wish within a grid of 40 squares. So this is quite a big task! 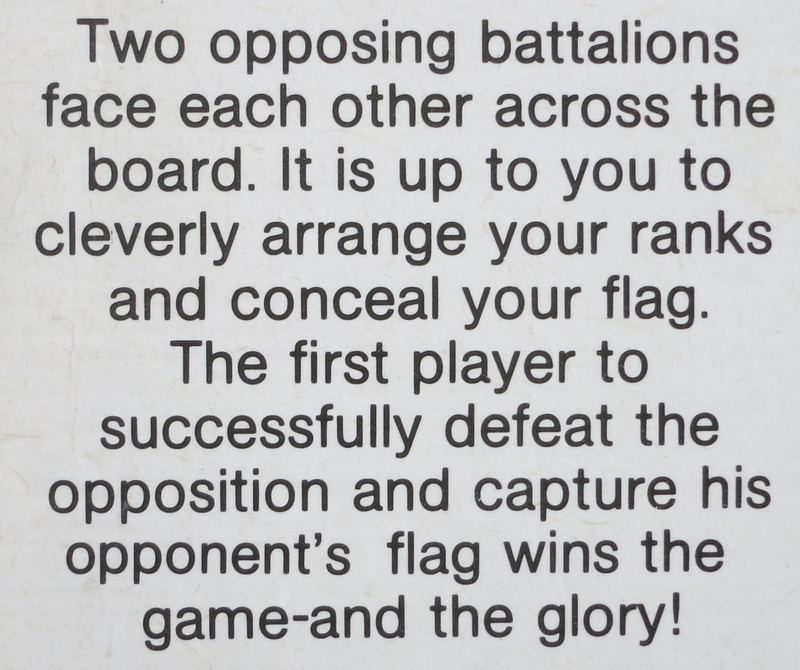 The idea being to position your flag in a way which you think is the most inaccesible to your opponent. My pieces are lined up ready! A lot of the thought that goes into this initial set-up phase is about what your opponent is expecting you to do and then trying to do the opposite! ​So will you put your flag tight into one of the corners? Or is that too obvious? Will you position bombs near the back or the front of your lines? How should you position your attacking pieces? Keep the strongest near your flag for defending later - or put him on the front line to attack early on? 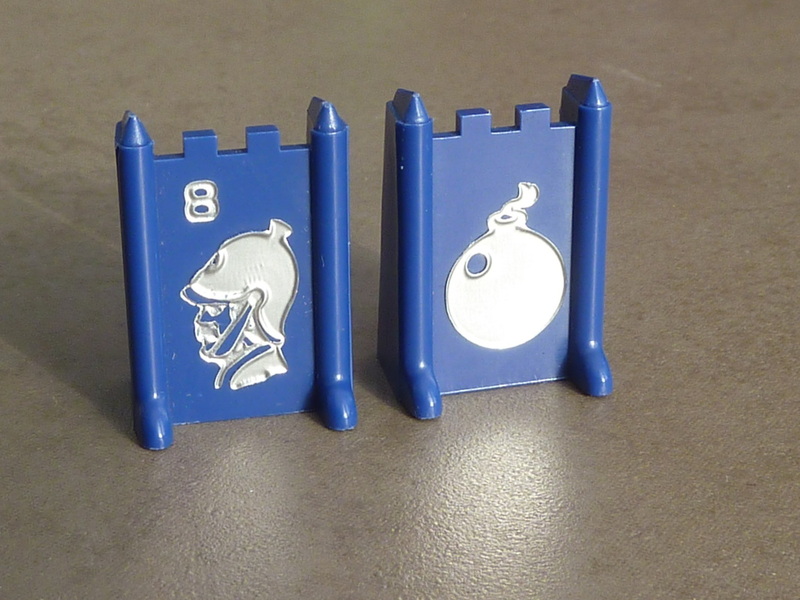 Some of the pieces are 'bombs'. These bombs, once positioned, can never be moved. Any piece that moves into a bom is destroyed, except the 'Sapper' unit. When attacking your opponent, you are allowed to see the rank of the winning piece. The 'Marshall' (above) is the most powerful piece on the board. It can only be defeated by the 'spy' (if the spy attacks first). The Sapper (above right) just loves bombs. He will merrily walk into a bomb and diffuse it. All other units are destroyed if they touch a bomb. The image on the right shows a close-up of the pieces surrounding my flag. When you are playing the game, one of the things you are looking out for, is which pieces your opponent isn't moving...Remember that the flag (the critical piece) and all 'bombs' cannot be moved onced positioned, so working out which these pieces are, is a critical step towards victory. Another important point to think about when positioning your pieces, is to remember to leave room for manaeovering your pieces. For example, if you look again at the image on the right, the Sapper piece in the bottom left hand corner is currently stuck there. There is no way it can move unless the bomb that is above it, is diffused by my opponent (only a Sapper can do that). Haha! My opponent doesn't know where my flag is! 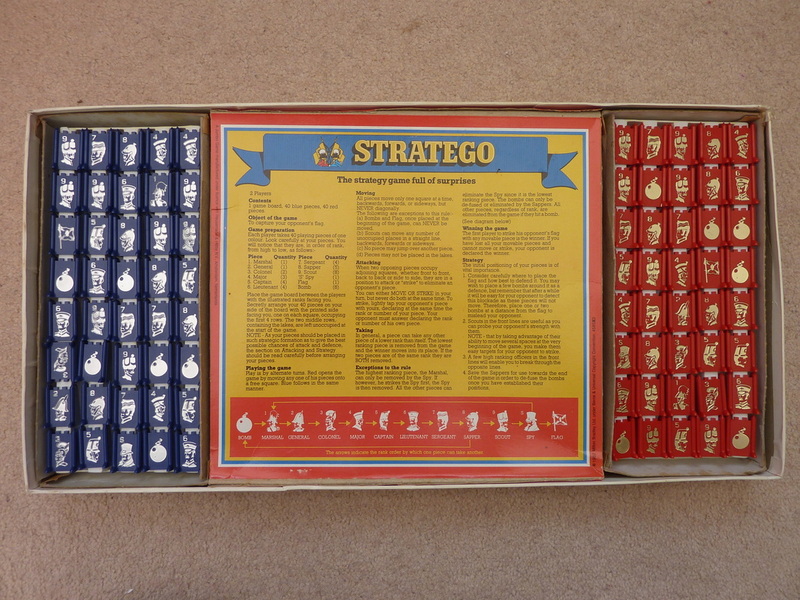 You can see from the image above, that Stratego employs a simple hierarchy structure for the ordering of the various pieces. So '1' beats '2', '2' beats '3', '3' beats '4' etc etc. up the chain. The one exception being the 'Spy' piece. This is the weakest piece on the board and can be taken by every other piece.. However, if the Spy attacks the 'Marshall' first, then it will defeat it. 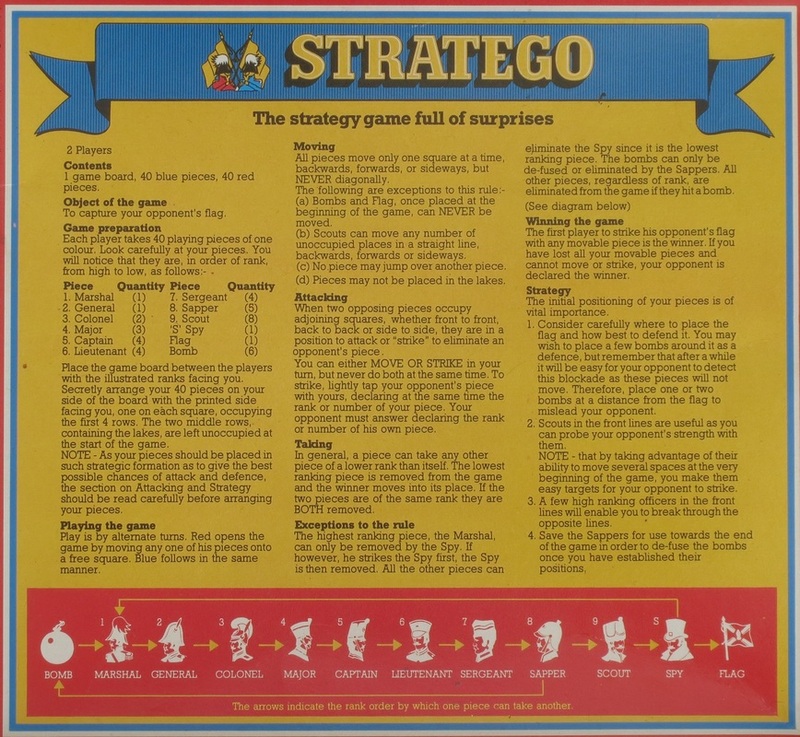 - An interesting and slightly odd rule which nevertheless creates an additional item of strategy. The board layout is simplistic. You can see from the image on the left that it is a simple square grid with dimensions of 10 x 10. However, there are two 'lakes' depicted on the board which are impassable and unusable. These account for 4 squares each. 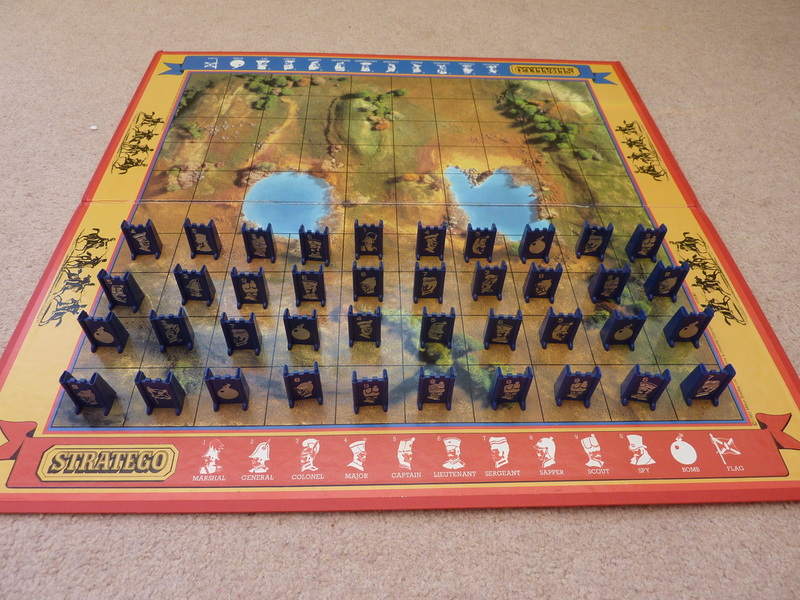 So there are only 92 usable squares in Stratego. With there being 80 pieces on board at the beginning of the game, freedom of movement is very tight at the start! Final few images below. First showing where my version was made. 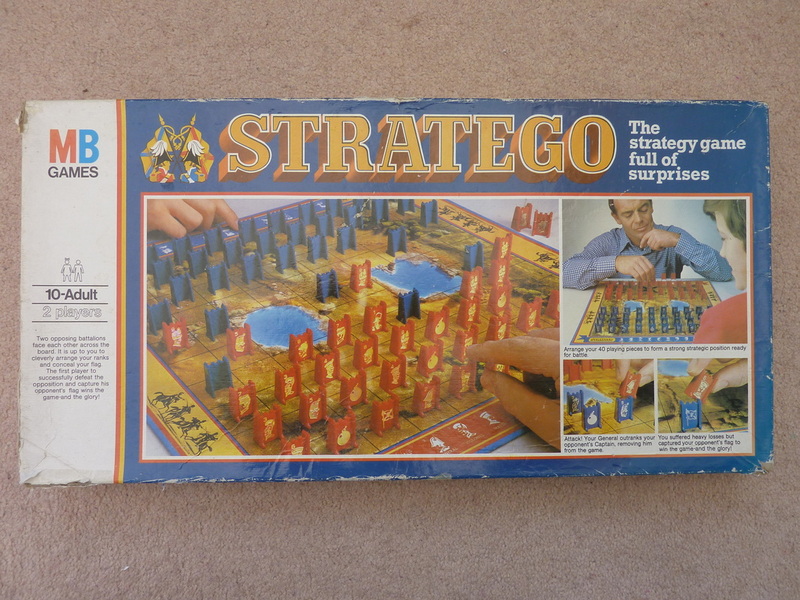 Middle image shows the synopsis that MB provide on the box and finally the full rules. Any comments about this game? Let me know, I'd love to hear from you!